If you’re someone who is interested in health and fitness, particularly when it comes to tracking and viewing information about your daily activity, perhaps you should consider checking out the Fitbit Flex, a wearable device that enables you to keep track of your daily activity, as well as other information, such as sleep, calories burnt, and more. I’ve actually had the Fitbit Flex for a while now and have enjoyed being able to keep track of my daily activity and occasionally my sleep. 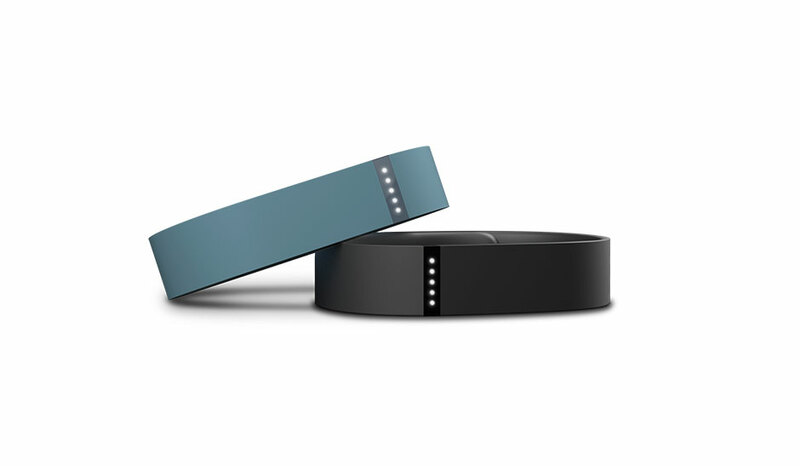 The Fitbit Flex comes with the tracker itself, two rubber bracelets (a small and a larger size), a metal “clasp” that is interchangeable between bracelets, a USB charging dongle, and a USB receiver that can be used to sync the tracker with a desktop or laptop via Bluetooth. 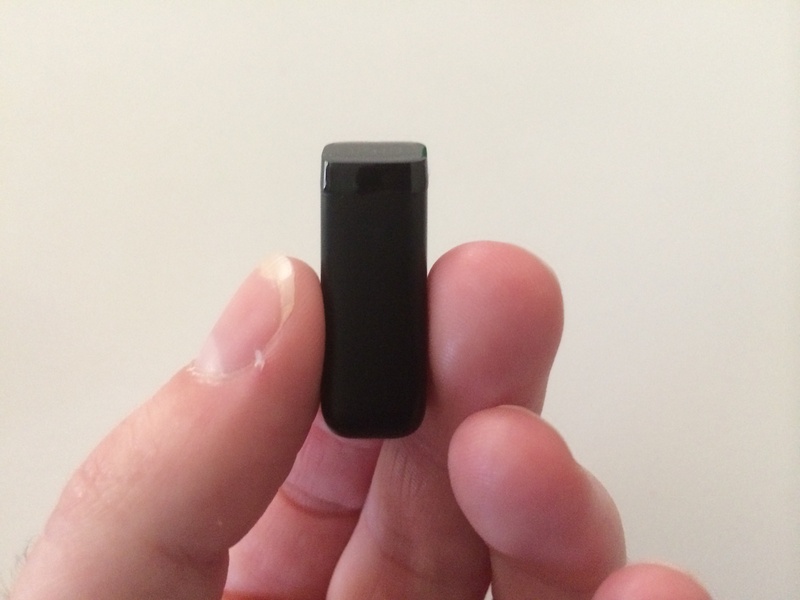 The tracker is small, made of a hard plastic, and features five LED lights toward the top of the unit, which are used to show one’s progress throughout the day, as well as whether or not the device is in sleep mode. Other than that, however, there is no other display of information on the device itself. The tracker unit itself records information using a MEMS 3-axis accelerometer, which is able to track your wrist motion, interpreting it into the number of steps that were taken, how far you traveled, and how well you slept. Additionally, the tracker includes a vibration motor, which is used to alert you when you reach your daily goal, as well as when the device goes into and out of sleep mode. 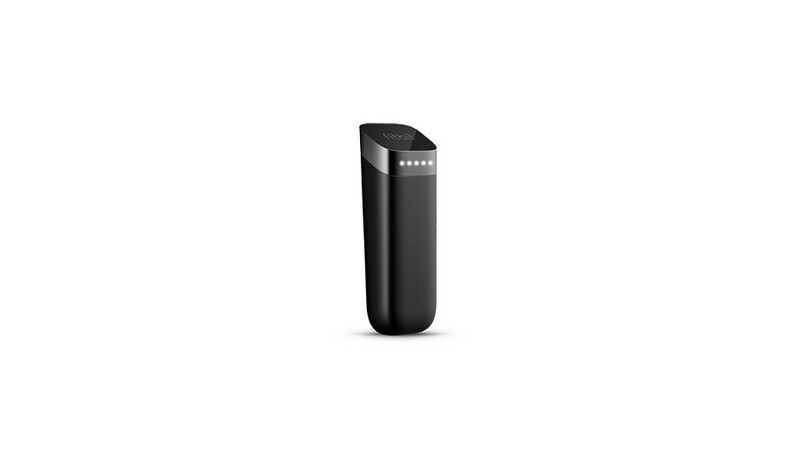 The Fitbit Flex’s tracker has a lithium-ion battery that can last for around five days, though I have been able to get longer out of the device with less frequent use. (I don’t usually wear the device all day, which may contribute to the battery lasting longer.) The battery can be charged using the included USB charging dongle, which can be plugged into a computer’s USB port or a wall-adapter (which I tend to use) for a device like an iPhone, etc. When charging, the Flex’s LED lights will light up to indicate the battery’s charge level. Once all five LED lights are lit up, the tracker is fully charged. 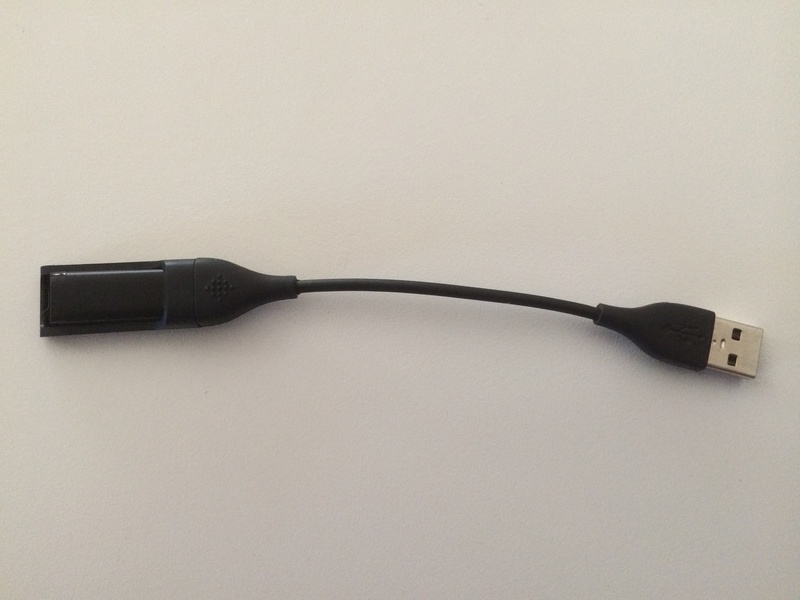 The Flex’s tracker also features Bluetooth 4.0, which can be used to communicate with certain cell phones, such as the iPhone and select Android devices, as well as with the small USB Bluetooth receiver that comes with the device. The Fitbit Flex is also water resistant, up to 10 meters (32.8084 feet), you can wear it all day, including when showering, washing your hands, or possibly even swimming. While I have not worn the Fitbit in the shower, I have worn it while washing my hands and it has held up pretty nicely. One issue that you may encounter (though this has never really been a problem for me) is that water may end up collecting in the rubber band, where the tracker sits. However, since the device is water resistant, this should not be much of a problem. 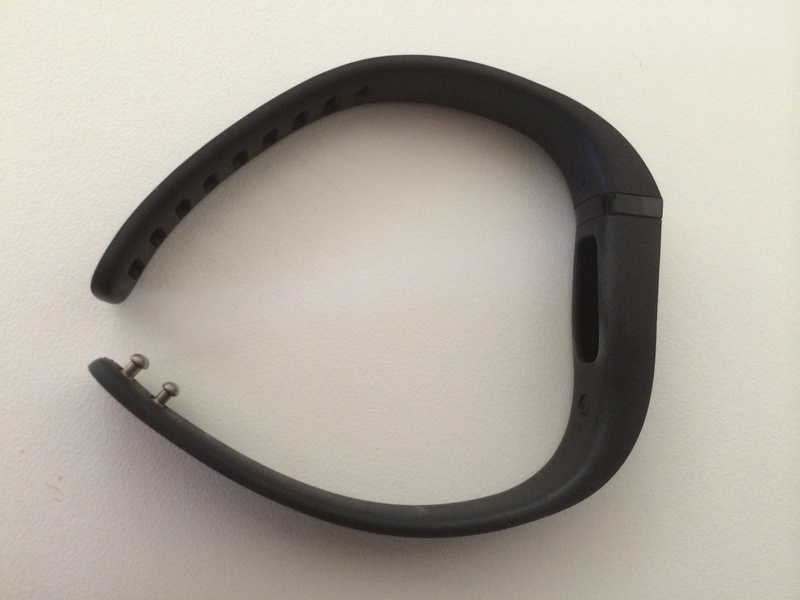 FitBit Flex Wristband, showing clasp and where the tracker fits into the wristband. I purchased the Fitbit with the black wristbands, and while it looks nice and is comfortable while on your wrist, you can occasionally notice scratches and scuffs on the wristband. However, they are not major (at least the ones I have managed to get) and can usually be rubbed off, or at least made less noticeable. The Fitbit Flex, while it may look simple on the outside, includes many features that make it worth the $99.95 price tag. The Fitbit Flex records wrist motion using its accelerometer and converts it into the number of steps that were taken, the number of calories burned, the distance that has been traveled throughout the day, as well as how one slept. As far as accuracy is concerned, the Flex seems to be fairly accurate, though since it is worn on your wrist, faster motions, like brushing your teeth, using a cash register, or just moving your wrist a lot, may be counted as steps. However, I don’t really see these as making too big of a difference in your overall activity level, even though it may skew the results a bit. The Fitbit Flex’s tracker features five LED lights, which are used to display how close to meeting your daily goal you are. Each of the five LED lights represents 20% of your daily goal, which you can set within the Fitbit iPhone or Android application or on the Fitbit website. In order to activate the LED lights so that you can view your progress toward your daily goal, you can simply tap on the tracker two times, which will illuminate the appropriate number of LEDs, showing your progress. In order to put the tracker into sleep mode, you can quickly tap on it a number of times, until it vibrates, at which point two LEDs will light up. The LEDs actually resemble two eyes and will flash back and forth, showing you that the device is in sleep mode. After that, if you tap the device twice to view your progress, you will instead see that it is in sleep mode, as it will display the aforementioned two LEDs lit up. To take the device out of sleep mode, can tap the device rapidly again until it exits and returns to its regular tracking mode. In order to view data on how active one has been throughout the day, you have to either use the Fitbit iPhone or Android application, or the Fitbit.com website, both of which allow users to view the information explained above, such as the number of steps taken, distance travelled, calories burnt, in addition to others. The Fitbit Flex has two different syncing modes when it comes to the app – one where you can sync your data when the app is open and one where the data continuously syncs in the background, provided you have Bluetooth enabled on your phone. Once you have synced your data to your phone or computer, you can view it on the app or Fitbit website, which features some nice graphics and other information regarding your activity. You can also view your activity and other information over time, such as weekly, monthly, or even yearly, should you want to see how active you have been compared to other periods in time. If you are unable to sync your Fitbit Flex with your phone or computer for a while, you don’t have to worry, as the device can hold up to seven days worth of minute-by-minute data about your activity and sleep. It can also hold your daily total for 30 days, in addition to summaries of your daily number of steps taken, calories, and distance traveled. Another nice feature is that you can add friends and compare your totals and other information against your friends. If you’re someone who’s competitive, this may be something that can help both you and your friends stay active, as well as have some fun by competing with each other. Fitbit also sends out a weekly e-mail that includes a summary of your weekly activity and other information. The e-mail will also contain stock-market like arrows that show whether or not you have increased or decreased the amount of activity, steps taken, calories burnt, and distance traveled, which is always interesting to see. Since I’ve owned the Fitbit Flex for a while now (about two months or so), I have enjoyed being able to see how active I am. Though I don’t usually wear it all day, or even everyday, I like that I can throw it on before I go to work, etc. and see how active I was during that time. The wristband is comfortable to wear, even if you are wearing a shirt over it, and it is lightweight so you don’t really notice that it’s there most of the time. It’s also easy to use and the app makes getting the information simple and easy. The tracker only takes a few seconds to sync with the app on your phone, which is nice, and when you have the app open, it syncs in almost real time, too, which is nice if you happen to be moving around when you’re viewing the information. I tended to wear the Flex more often when I first got it, and after a while the novelty of it started to wear off, but I still do like to wear it and see how many steps I have taken and how far I’ve walked throughout the day. The sleep tracking functionality of the device is also a nice feature, and it is interesting to see how well you slept throughout the night. This feature seems to be pretty accurate as well, though perhaps a bit less so than the actual step tracking capabilities of the device. For example, if you go to bed and are laying down watching TV or using your phone and aren’t moving very much, the Fitbit Flex may record that time as you being asleep. However, there doesn’t really seem to be another way to track sleep other than with motion right now, so that’s not a big deal. Overall, if you are interested in seeing how active you are throughout the day, and are interesting in seeing how well you sleep during the night, you may want to consider purchasing the Fitbit Flex, which is priced at $99.95 and can be purchased from the Fitbit website, as well as stores like Best Buy, Target (where I bought mine), and other retailers. 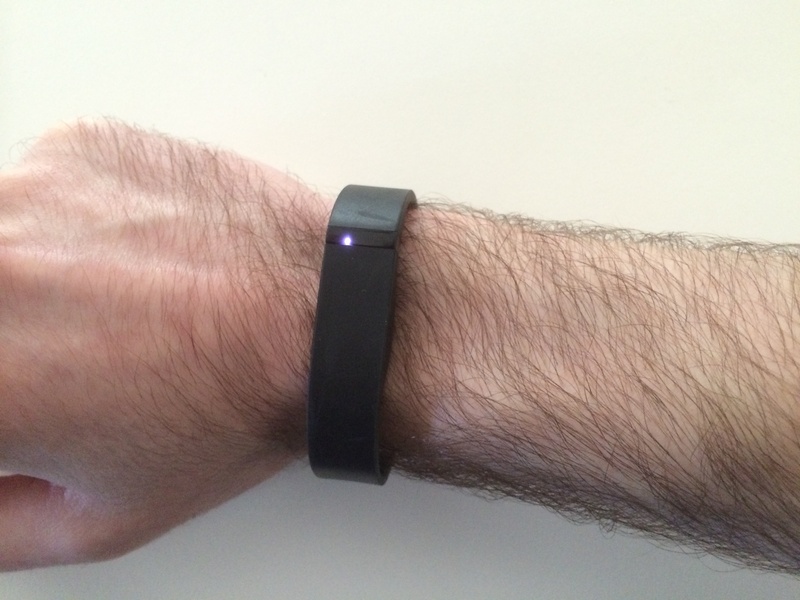 If you have a Fitbit Flex or other wearable fitness tracking device, what do you think of it? How do you like using it? Do you have any comments on it that aren’t included in this review? Please feel free to post your thoughts and opinions below! Additionally, if you like what you see on the TechnicalCafe.com website, I invite you to check out the TechnicalCafe YouTube channel, which features a programming tutorials and other computer and technology related videos. This entry was posted in Hardware Reviews on June 11, 2014 by Jamie.